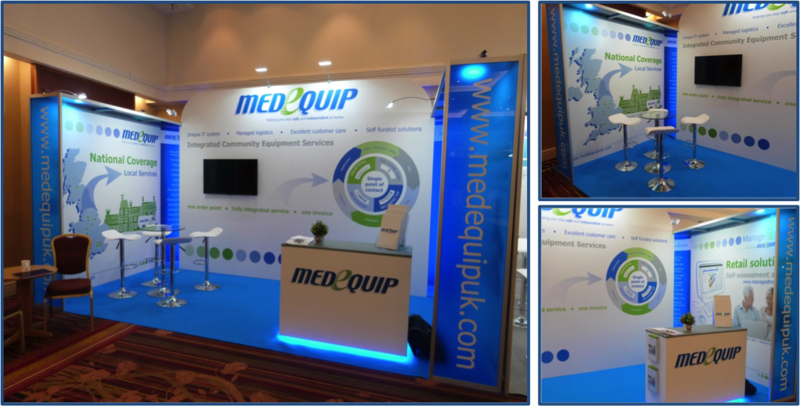 NAEP 2014 saw the launch of Medequip’s new exhibition stand (see pictures below). The result of a lot of BD work hours, especially from Matt Ward and his team, the stand represents a significant investment from Medequip and one that was very well received by both Medequip clients and potential clients alike. The stand, as well as having inbuilt longevity through the easy to replace panels is also flexible in footprint and can be increased or decreased in both width and depth to accommodate all of our trade fair commitments. The new stand provides for a modern, professional looking, well lit, uncluttered and inviting Medequip representation. The integral TV also allowed us to showcase our new Medequip Video – showing the whole process from assessment to delivery in a very contemporary way. The video, Medequip’s first of two this year, also drew positive reaction and comment and I predict that we will see similar from other providers in due course.